Steve Carrell’s daughter selling lemonade to the paparazzi. 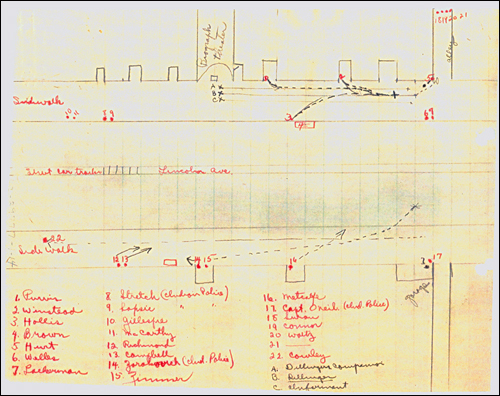 Coordinated surveillance of a location is referred to as a stakeout. It’s generally performed covertly in order to collect data about a criminal, a celebrity, or their activity. I could wax on about my own quiet neighborhood erupting with suspicion when tight-lipped Ray-ban-clad drivers were parked on our corner for days. This blog post however refers to a different steak out – having a cut of meat from the hindquarters of an animal, that is eaten away from one’s home. The Huckleberry Murders by Patrick McManus. The reality is that I’ve been eating away from home more often than I’d like. Plates are put down at perfectly set rounds like the orchestra laying out a concerto and the meal is always centered around animal protein. My method of combatting the onslaught of pliable chicken parts is to order vegetarian but so often that consists of heavy pasta or some type of pastry stuffed with roasted vegetables. It’s difficult to eat meals at events and keep them light so I was delighted at the recent hospital benefit when the server placed a beautiful carmelized cauliflower steak in front of me. It had a small scoop of polenta beneath it and a lovely vegan red pepper sauce dashed along one side. It caused me to set out on a mission to stealthily gather intelligence about other vegetable steaks. My research led to a proliferation of fake meat products. They’re fine for some but not usually my preference. I’m focused on the real deal – those putting a garden grown variety in the center of the plate. Like my meal at the benefit, Sharon from Fleurt Butter suggests making my winter favorite, cauliflower, the star. The Happy Herbivore gives the leading role to my father’s favorite, the portabello steak. Alas, I may have tired of them from over-consumption in an earlier production. The “I can’t wait to try” but must wait until they’re available goes to Dan Barber of Blue Hill His recipe showcases Parsnip steaks – using another personal favorite. Finally, with the same impeccable timing that she shows in all of her recipes, Natalie from FoodBlogandtheDog showed up on time with seasonal red cabbage – something that is ample in our home this week. The simplicity of roasted cabbage with the deep intensity of the Middle Eastern spices creates a vegetable serving that can hold it’s own. Mix together well and store in a glass jar with tight fitting lid. Preheat the oven to 35o. 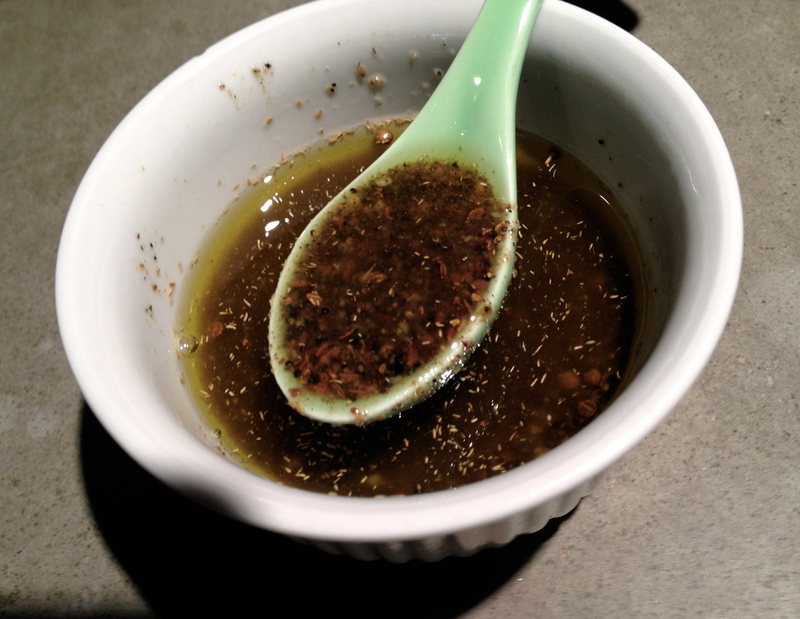 Mix the oil with the za’atar in a small bowl. 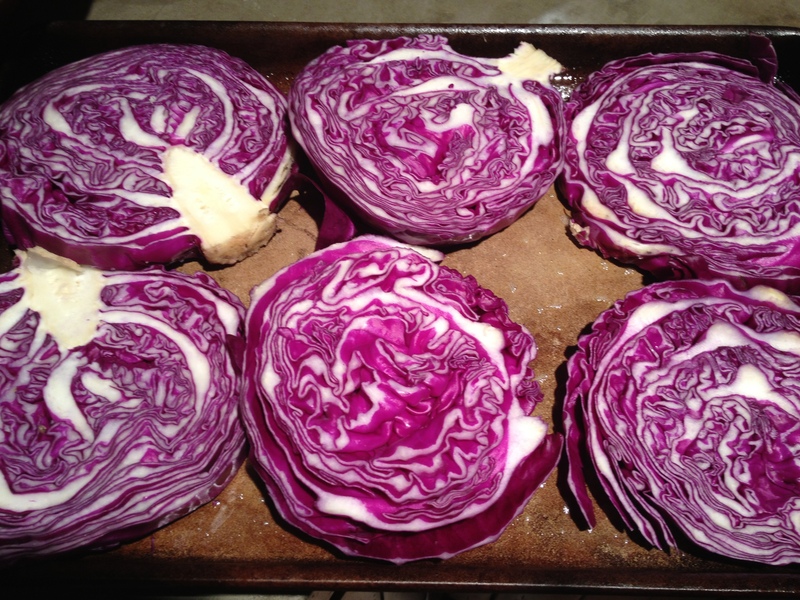 Place the cabbage steaks onto a lined baking sheet. Drizzle the za’atar oil all over them. Bake for 20 – 25 minutes depending on thickness and serve sprinkled with sea salt. What next meal are you staking out? They look great! I still have loads of cabbages here, I have just made Korean Kimchi for the first time & love it. New favourite thing! It’s fab in stir fries and omelettes/pancakes. Thanks for the recognition!! My husband loves kimchi and I should learn how to make it. Cauliflower steak sound really good. Was it a slice of cauliflower or pieces held together? a slice. Take a look at the link – you’ll see something similar! Oh, I see. I went to the link for the hospital. 🙂 I’ve got to give that a try. Fantastic idea! Looks delicious! And beautiful, too! These are an easy way to create a light entrée – or side dish for some. Oh, yum. Roasted cauliflower is a big favorite of mine! Great idea. And you know it’s mine too! Love the stuff. Oh, that cauliflower sounds wonderful! I’ve been roasting broccoli, cauliflower and other veggies every other week or so, to add to cold salads or warm rice or noodle dishes through the week. It would be so nice to see creative vegetarian offerings more often on a menu. Your cabbage steak looks fantastic, too! We need to put more pressure on restaurants and other food service centers to consider other venues for vegans and vegetarians. This looks great to me! I’m not sure my hubby would give up his regular steak for it though. 🙂 But, I have a friend whose husband was just diagnosed with type 2 Diabetes and she is struggling with how to cook and what to cook. I’m going to send this to her! Maybe it can be a side dish for your husband? Will have to try…. the cabbage for me & the spices on animal protein for Larry. He loves his steaks & it is like pulling teeth to get him to even eat fish or chicken. It can be a side dish for Larry. Can’t wait to try this! We have steaks almost every week as it’s my husband’s tradition, but this looks amazing. You can try them as a side for your husband and the main meal for you. Let me know if you like it. MMMM! What a superb & very appealing recipe! I must make this soon! yummo! I agree, the meat substitutes just don’t satisfy me either. Your roasted cabbage looks fab. Actually, anything roasted is yummy (just roasted some fennel bulbs and leeks the other night). I adore roasted fennel – maybe if I squish them into a steak like the parsnip recipe? Vegan steaks – I love it! Those cabbages are so attractive! What a wonderful meal, Tammy. A really inspirational post: I shall be cooking this for sure. I’d love to hear if you do try them Kate. This weekend were onto colcannon and perhaps at the last of the cabbage trail. wow, love that treatment of red cabbage.I was talking with a chef friend, who is experimenting with sweet potato piccata–taking thick slices of the tuber, and pan-sauteeing with lemon, garlic, white wine, and capers, a la chicken piccata. sounds like a great idea to me! I could definitely enjoy those Nancy. Thanks for the thought. What a concept! Cabbage steaks… You are a dear. This looks great. Check out the other recipes too Amy. We just need to expand our thinking. OMG–I just wrote about trying to use up parsnips. Will definitely need to check out the parsnip steak! Alas, I believe I’m down to one last red cabbage (which will need to be saved to color Easter eggs) so will need to remember this for next year! Parsnips are in my top three vegetables and very easy for me to use! I’m intrigued. My kids tell the pediatrician that the one food they hate is grilled radicchio, so my worst meal involves leafy veggies and the grill. I’d like to redeem myself. radicchio is bitter and I also don’t love it. Cabbage – my kids really love it sautéed in broth. I’m so looking forward to a nice meaty and cheesy lasagna! I’m almost finished with my 3-week cleanse! Oh, have a cabbage steak insteak er – instead! This is BRILLIANT! I am so excited by this post. 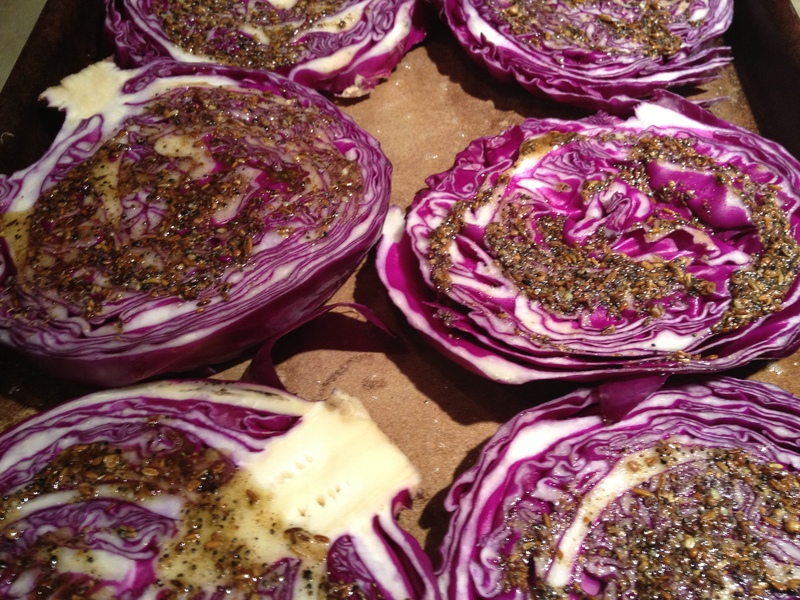 Never, ever, once thought of red cabbage steaks before now. Thanks Kathy. And I think they’re a pretty good follow on to your cleanse. The hardest part was slicing the cabbage. This sounds and looks so good. 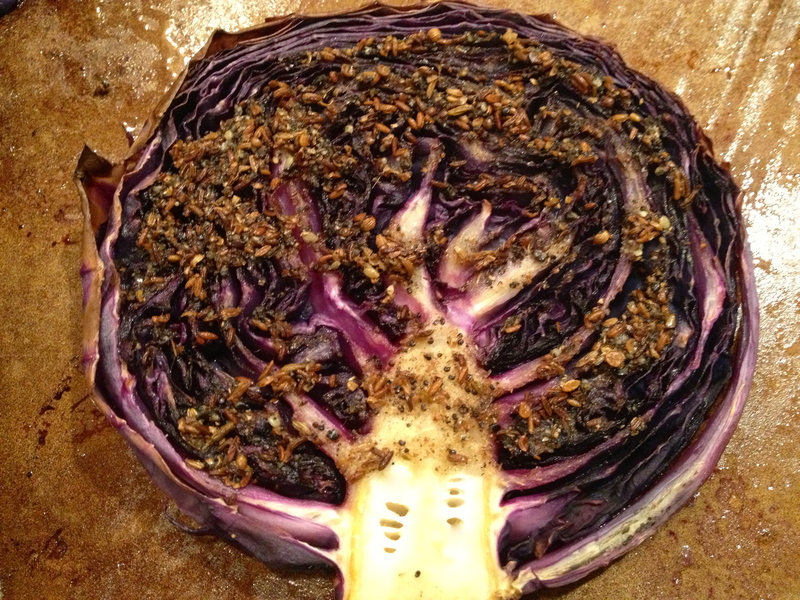 I roast a lot of veggies, but never tried cabbage. And with those spices…yum! I love the idea of the “steak”. Let me know how it goes Estrella. Cauliflower steak, but spicy Indian style by Vikram Vij & Meeru Dhalwala – some of the best Indian chefs ever. You can never go wrong with their vegetarian dishes. That sounds terrific. I love Indian spices.